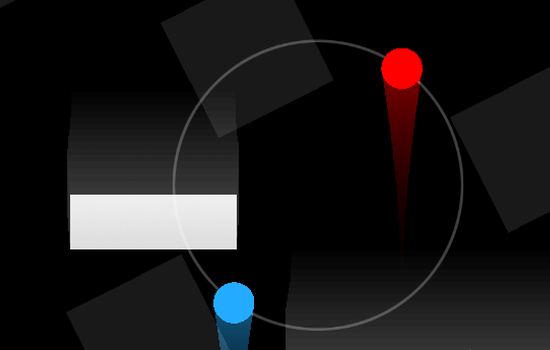 Duet is a decidedly simple indie game that sees you guiding two coloured orbs around static and moving obstacles, and these are abstract in the extreme; they amount to no more than squares and rectangles. Despite the minimalism and simple gameplay, the naming of the levels after the Kubler-Ross Model of Grief and the inclusion of enigmatic quotes at the beginning of every stage hint at something philosophically bigger than itself. The excellent soundtrack, composed solely by Tim Shiel, plays a major role in reinforcing those deeper themes. The album opens with "Theme for Duet", a melodious affair with dulcent piano strokes and violin strings. In many ways it sets the stage for the atmospheric and ambiance-laden tracks that follow. Though used faintly in the background, the theme also introduces the main leifmotif the artist uses abundantly throughout the album. Overall, a wonderful intro. Listening to Duet's album away from the context of the game can be a misleading experience, especially for those uninitiated. Duet has no visible on-screen characters, no monsters to fight, no level upgrades, nothing of that sort. Yet, the album invokes the feeling of mute tragedy and constrained triumph. As I said before, Duet hints at something philosophically bigger than itself, as if it the creator sustained a personal tragedy and is using this as an outlet for that experience. Where the gameplay serves as a visual representation of what the game has gone through, the audio serves as a narrator. The next few tracks, "Nay", "Tempa", "Exchange", and "Laps" are sibling counterparts to each other, providing undying support with pulsating tones. This section of the album feels the most sorrowful with underlining theme of melancholia and possibly depression. I would liken this section as the auditory version of (mostly) deperessive films like Requiem For a Dream, Melancholia and Schindler's List. The electronic bleeps help alleviate the gloomy air somewhat but it still lingers around like a thick fog. "Crater" is the most 'quiet' track from the album. It relies heavily on low tones and interesting reverb effects. It's also one of the few tracks that doesn't prominently feature electronic beeps and boops - it does so only in the last few seconds. "Patinkin" feels a touch of place with its repeated melodic patterns and emphasis on a more 'pop-oriented' sound. It's an interesting oddity that marks a sharp departure from the otherwise hypnotic and lucid tracks via its catchy nature. It also marks an overall shift in the dynamic, as the album only gets louder and complex from here. Every track from Duet's album is its own story, and when heard chronologically it can be quite hard to tell where one song ends and the other begins. The effect is due in no small part to the subtle and wonderful segueing. One cannot help but visualize oneself as a drifting astronaut listening to the woeful tales of the space. "Arete I" and "Arete II" are the most complex and rich compositions from the album, with the latter being the most often played during the "Endless Run" mode of the game. The naming of these two songs is unclear, though they might be named after the Greek notion of moral virtue or a reference to Arete of Cyrene, a prominent Cyrenaic philosopher. The latter makes sense because Cyrenaics derived pleasure from calm reflection, not jubilant excitement - the very mindset the player adopts while engaging in (especially) the "Endless Run" mode. The Cyrenaics viewed pleasure as the ultimate goal of life, and recognized pain and pleasure as two emotions within the soul. This thought echoes in the high score mechanic of "Endless Run" in which breaking a previously held high score can lead to pleasure while failure to do so can lead to pain. They further explain pain and pleasure as violent and gentle motions in the soul, respectively. Going back to deriving pleasure from calm reflection, the player must be in a non-excitement state of mind if he/she is to make smooth and uninterrupted progress. This thought is reflected in and projected by the excellent "Arete II". Duet's OST is a phenomenal piece of work that brings to mind the works of Pink Floyd, David Wise and Robert Schroeder (the composer of the game, Challenge of the Gobots). Every track is a fantastic blend of minimalism, atmosphere and ambiance. With this album, Tim Shiel has proven himself to be a very solid video game composer indeed. Item Reviewed: On the music of Duet 9 out of 10 based on 10 ratings. 9 user reviews.